Volkswagen, the largest European automaker, said Wednesday that its net profit dropped 74 percent in the first three months, even as it gained market share in the worst environment for car sales in decades. In an unexpected announcement a day before its annual shareholders meeting in Hamburg, the company said in a statement that profit fell to 243 million euros, or $314 million, from 929 million euros a year earlier. Its earnings were supported by a gain of 600 million euros booked on the sale of its commercial vehicles business in Brazil. Revenue slid 11 percent to 24 billion euros, despite tax incentives in Germany and other European countries to encourage drivers to trade up to more environmentally sound models, as the global automobile market shrank by nearly 21 percent from a year earlier. VW sales rose in Brazil, China, Germany Poland and Russia. The automobile group, which includes the Audi, SEAT and Skoda brands as well as Volkswagen’s own brand, said last week that it had raised its global market share to 11 percent from 9.7 percent in the quarter a year ago. 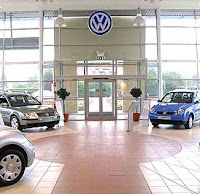 Its Volkswagen brand increased its share of the global market to 7.4 percent from 6.3 percent. On Wednesday, the company said it expected that it was well-positioned to gain on rivals during the financial crisis, with nine brands and young model range. It plans to introduce more new and low-consumption models this year. Volkswagen, based in Wolfsburg, Germany, has cut output and working hours to keep production in line with demand. The company warned that “the high volatility of the market does not permit any reliable forecasts to be made” for the rest of the year, but that it expected its earnings to decline. Its shares have lost about 12 percent of their value this year. They fell about 1.6 percent in Frankfurt afternoon trading Wednesday, giving Volkswagen a market value of about $98 billion. The European Automobile Manufacturers Association said last week that passenger car registrations in Europe fell by 9 percent in March from a year earlier, the 11th consecutive month of decline. In Paris on Wednesday, PSA Peugeot Citroën said sales in its automotive division fell 23 percent in the first quarter from the period a year ago. Volkswagen said Wednesday that it had decided to produce its New Small Family models, which will carry the Volkswagen, Seat and Skoda brands, at its plant in Bratislava, Slovakia. The first vehicles are expected to roll off the production lines in early 2011, it said, and the decision ensures the security of about 1,500 jobs there. It also said it would spend about 300 million euros to produce the new Audi Q3 S.U.V.’s at its SEAT facility in Martorell, Spain. Production is to start in 2011, with annual production capacity of up to 80,000 units.